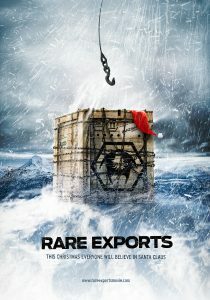 Finland isn’t known for it’s film exports, so here truly is a ‘Rare Export’ but should we return it? It’s not exactly in the spirit of Christmas is it? This film is rather a prequel to two short films that the director made in 2003 and 2005 (both I will stick at the end of this article) where Santa isn’t the merry old fat man we’ve come to know and love but is rather a beast of the wild that is tamed and exported around the world. But deciding that some short films weren’t enough, Jalmari Helander decides to make a feature film about his ‘hunters’ before the events of Rare Exports Inc. & Rare Exports: Official Safety Instructions. I have to put this film into context because when viewing the film, not knowing much about it, it seemed very strange afterwards but now it kind of makes sense. However, it might be worth watching without seeing the videos included here, but it’s your choice. Either way, the story is about how some corporate diggers are excavating something from a mountain near a remote village in the snowy outdoors. But it is a young boy who works out what is buried beneath and is taking every precaution just in case, whether it’s taping cardboard to your bum or carrying around a shotgun, he’s not taking any chances. I read somewhere that this harks back to the kiddie films of the Eighties like The Goonies where the kids were always right and the adults were idiots, but this has much more of a horror element to it. In fact, it is very funny in different places for different reasons but always keeps a dark, sinister edge whether it’s the weird wooden dolls, the crazy rich excavator or the creepy Santa they find, there’s always a tinge of horror at all times. The film is very well directed and, like many have said (mainly because of the snow) reminds people of The Thing, but all the set-up’s are there and around the whole thing is the myth of Santa Claus (or Claws in this case). It makes for a very exciting, disturbing experience that is set around a time where people are supposed to get together and for someone who doesn’t really enjoy Christmas, like myself, it makes a welcome distraction to all the ‘niceness’ of the Christmas season. The acting is, for the most part, very impressive and the end sequences with hundreds of naked old men running across the mountains is both funny and breathtaking at the same time. The film finds a great balance between horror, terror, humour and remembering that it shouldn’t take itself too seriously, the gag is that it’s about Santa after all. I always found something creepy about a fat, old man going into children’s houses at night and giving them presents, seeing if they’ve been ‘naughty or nice’ and this plays on people’s insecurities especially at a time where paedophilia is all over the news these days. It also has a rather serious, dramatic edge with an obviously painful father/son relationship, a man who is frustrated with the world and a ‘coming-of-age’ element about sacrifice and becoming independent. It could also be seen as a war of male generations, the son against the father, and the father against his own father, which in this case is represented by Father Christmas, it would make sense seeing as there is no females in the whole film but rather a world of manly hunters where soppy things like Christmas have no place. Overall, the film is enjoyable and the last five minutes is rather strange but makes sense once you see the short films. It might have a few plot holes but has been well thought out, perfectly directed and for something that could have so easily been one big joke, remains an impressive piece of work that the director clearly cared about. I recommend that you forget the usual Christmas ho-ho-Hell’s and delve into a dark place where being naughty or nice is a life or death decision.